Being a frequent flyer can be tiring in more ways than one, with food probably being the last thing on your mind. With Vistara’s palatable food options comprising a variety of cuisines, we now have a chance to have a journey that’s truly pleasing. Here is a list of our recommendations from their summer special menu, which will ensure a happy feast, even while cruising 35,000 feet up in the air. 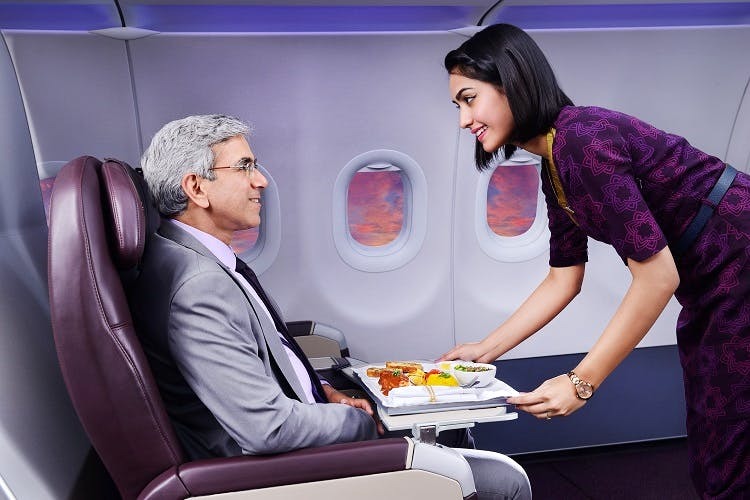 Vistara is the only South-East Asian airline that offers this option. Sip on a cup of fine India Estates Blend amidst the clouds and catch up on that long overdue reading session. Savour this delicious breakfast meal consisting of potato rasmissa cooked with yogurt and spices, complemented with soft paneer paratha and creamy, melt-in-your-mouth dahi kebabs. Bust those morning hunger pangs with this scrumptious South Indian breakfast. With crispy spinach vadas soaked in flavourful sambar and a delicious tri pepper uttapam, you are sure to have a great meal. Start your day right with this protein packed breakfast. This combo comes with egg whites, chicken and pepper scrambled to perfection, with pan seared chicken slices with a tangy cherry tomato ragout to tie the flavours together. Made with fresh ginger and curry leaves, this home style chicken curry with rajma cooked in a thick gravy is served with rice. This meal is sure to leave your taste buds satiated. Palak paneer made from puréed spinach, seasoned with garlic and other Indian spices, along with creamy dal makhani and rice is the quintessential Punjabi meal. This perfect combination reminds us of home, while being nutritious and healthy too! Kofta made in flavourful onion-tomato gravy served with keema pulao makes for a pretty tempting combination. The beans poriyal sautéed in spices, topped with fresh grated coconut just adds to its rich flavour. Who can say no to a flavourful chocolate ganache? It’s also so rare to find a good one on an airline that we’re extra excited! Rich and creamy, these whisked sponge swiss rolls make for a sweet treat. Needless to say, this makes for a perfect end to a lovely meal. Indian desserts at their best – this classic, sweet fudge barfis make us nostalgic. With a variety of options to satisfy your sweet tooth, this dessert is sure to be loved by children and adults alike. Vistara’s elaborate food options is a wonderful addition to an already enhanced journey. They also offer special meal options for customers with dietary and health restrictions, as well as meals for babies. With renewed meal options every cycle, we are sure to have an array of interesting dishes. This gives us all the more reasons to book with them! Fly the new feeling here for an unforgettable experience.